The world is still asleep in the early fog covered morning of the month of Poush, one of the winter months in Bengali. Mahfuz however is standing with his eyes at the camera lens waiting for the first sign of sun. Not only him but the entire cast of Poush Masher Pirit (Love in Winter) is ready in their respective positions waiting for the director, Nargis Akhter to announce “Action”. Poush Masher Piri,t the newest addition to Nargis Akhter's work, unlike her other movies, is a film based on fiction. However like all her movies Poush Masher Pirit carries a social message, for the maker's vision of taking Bengali cinema to a global audience, does not release her from her obligations as a development activist. 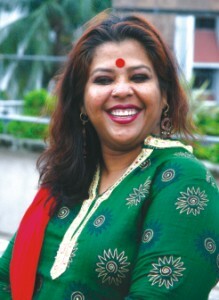 One of the most successful female directors of today, Nargis Akhter has won National Awards for her films Meghla Akash (The Cloudy Sky) and Megher Kole Rod (Sunshine in the Clouds), both commercially successful yet carrying strong social messages. A student of social welfare of Dhaka University, Nargis has the experience of making documentaries and telefilms while working with development organisation exploring the effectiveness of visual media as a tool of development communication. Her entry into the world of feature film has been triggered by the censor restriction that her first documentary “Ajana Ghatak” (Unknown Predator), on the subject of HIV AIDS, faced while airing in television in 1996. According to Nargis, television has limited viewers. Moreover it is a drawing-room media so members of a family often do not sit together to watch a show, which is very important in case of social message communication. In addition, frequent interruptions often stop the viewers from absorbing the message properly. On the other hand, exhibition of the material in a hall can create the desired effect, wherein viewers can pay full attention and absorb the message through entertainment. “You can call it education through entertainment. I began to think of making a feature film for the halls, which will have all the necessary elements of a commercial or regular film, that is: song, dance, fight, comedy, suspense, plus a development message,” says, Nargis. This thought has brought forward Nargis Akhter's first feature film Meghla Akash that deals with the issue of HIV AIDS prevention and control. Again superstars from Bangladesh and India have adorned the movie making it a box office hit and receiving the National Award in six categories. “When you get success from an experimental work, it automatically works as an inspiration for your next course of action. I came to understand that this is the right media where lots of issues can be talked about openly plus a large number of viewers can be covered,” says Nargis. Poppy, Ahmed Rubel and Tony Dias at the shooting. Her recent passion however is the movie adaptation of various fiction. She has already finished Obujh Bou (The Innocent Wife) under the banner of Impress telefilm, which is based on the popular novel by Rabindranath Tagore, “Shamapti”. However the film that she holds close to her heart is the upcoming Poush Masher Pirit which is based on Narendra Mitra's short-story Rosh. The entire shooting has been done at a remote village named Khajuraho, in Jessore. Describing the village she says, “Not a single electricity pole is there. It is lush green and beautiful. All you can see are date trees and mustard fields.” Nargis's cast includes TV and film actors, who have gone through rigorous training to adapt to the life of gachi, people who cut the date trees to collect juice and make molasses. Poppy and debut actress Priyanka. Reminiscing the hard work of the artists in the film Nargis praises one of the lead roles, Maju Khatun, acted by actress Poppy, saying “Poppy has already become an expert in making molasses. We have planned that on returning Dhaka we shall open a shop named 'Poppy's Molasses House,'” she laughs. In this film she shows how men use women for their financial interest and personal gains and what misfortune ultimately comes of it. Like her other films the greatness of woman is depicted because of her sense of justice and forgiveness. The marketing strategy of this film is also different as Nargis plans to release the movie from Monihar Hall of Jessore. With the help of Square Group and other corporate houses she has plan to invite Indian film star Amitabh Bacchan at the premier show. Amitabh had played the leading role in the movie adaptation of Rosh made in Kolkata many years back. Although Shoudagar (Merchant), the West Bengal movie adaptation was not a commercial success Nargis believes her luck will be different as she has changed the story to suit to present times. She says, “I went to Kolkata and contacted Norendra Mitra's family and bought the copyright by donating an amount to the trust that they have opened in Norendra Mitra's name.” At first, the script for a tele-film has been written but as the director in Nargis could not be happy and she has spent almost three years researching on the script for a full-length feature film, at the same time selecting cast and location. On hearing about Nargis' endeavour, writer Rafiquzzaman has taken over the responsibility of the script, writing the entire script in the dialect of Jessore. The famous folk musician Allaudidn Ali has worked as the music director. Nargis is very hopeful about Poush Masher Pirit: “I don't think I shall be able to make another film like this one,” she says.